ELA.RL.3.1: Ask and answer questions to demonstrate understanding of a text, referring explicitly to the text as the basis for the answers. ELA.RL.3.5: Refer to parts of stories, dramas, and poems when writing or speaking about a text, using terms such as chapter, scene, and stanza; describe how each successive part builds on earlier sections. ELA.RI.3.1: Ask and answer questions to demonstrate understanding of a text, referring explicitly to the text as the basis for the answers. ELA.RI.3.2: Determine the main idea of a text; recount the key details and explain how they support the main idea. ELA.RI.3.8: Describe the logical connection between particular sentences and paragraphs in a text(e.g., comparison, cause/effect, first/second/third in a sequence). ELA.W.3.1: Write opinion pieces on topics or texts, supporting a point of view with reasons. ELA.W.3.2: Write informative/explanatory texts to examine a topic and convey ideas and information clearly. ELA.W.3.3: Write narratives to develop real or imagined experiences or events using effective technique, descriptive details, and clear event sequences. ELA.W.3.6: With guidance and support from adults, use technology to produce and publish writing (using keyboarding skills) as well as to interact and collaborate with others. ELA.W.3.7: Conduct short research projects that build knowledge about a topic. ELA.W.3.8: Recall information from experiences or gather information from print and digital sources; take brief notes on sources and sort evidence into provided categories. 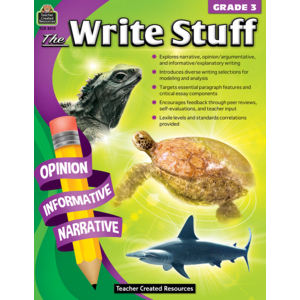 ELA.SL.3.2: Determine the main ideas and supporting details of a text read aloud or information presented in diverse media and formats, including visually, quantitatively, and orally. ELA.SL.3.1: Engage effectively in a range of collaborative discussions (one-on-one, in groups, and teacher-led) with diverse partners on grade 3 topics and texts, building on others’ ideas and expressing their own clearly. ELA.SL.3.6: Speak in complete sentences when appropriate to task and situation in order to provide requested detail or clarification. ELA.L.3.1: Demonstrate command of the conventions of standard English grammar and usage when writing or speaking. ELA.L.3.2: Demonstrate command of the conventions of standard English capitalization, punctuation, and spelling when writing. ELA.L.3.3: Use knowledge of language and its conventions when writing, speaking, reading, or listening. ELA.L.3.6: Acquire and use accurately grade-appropriate conversational, general academic, and domain-specific words and phrases, including those that signal spatial and temporal relationships (e.g., After dinner that night we went looking for them). ELA.L.3.5: Demonstrate understanding of figurative language, word relationships and nuances in word meanings. ELA.L.3.4: Determine or clarify the meaning of unknown and multiple-meaning word and phrases based on grade 3 reading and content, choosing flexibly from a range of strategies. Common Core State Standards and Expectations© Copyright 2010. National Governors Association Center for Best Practices and Council of Chief State School Officers. All rights reserved.